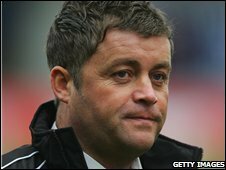 Struggling Northwich Victoria have appointed former Lewes boss Steve King as their new manager. King replaces Dino Maamria, who was sacked last month following a spell on gardening leave. Caretaker-manager Mike Marsh left the Vics following Saturday's 2-1 defeat at home by fellow strugglers Eastbourne. Lewes sacked King this summer after he led the minnows from the Ryman Division One South to the Blue Square Premier in just five years. Surely he has earned the chance to manage at BSP level? Northwich, currently 22nd in the Blue Square Premier, have also revealed that strikers Trevor Benjamin and Michael Byrne have left the club.